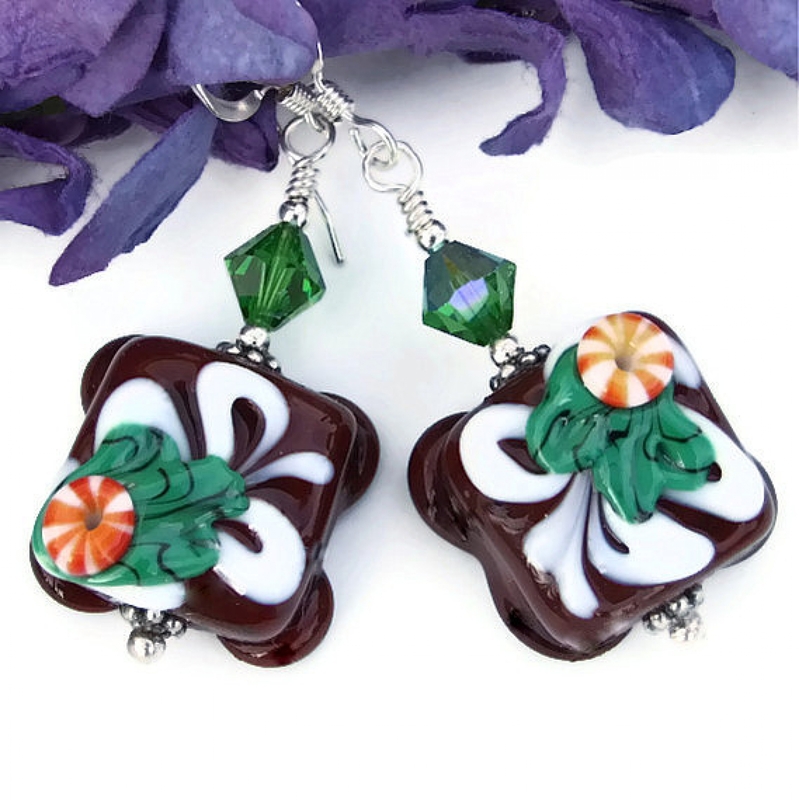 The glorious chocolate candy lampwork beads have so much detail and texture in them - little works of art. Take a close look and you will see a drizzle of white icing, a bit of greenery and a peppermint all on a backdrop of luscious looking chocolate colored glass. 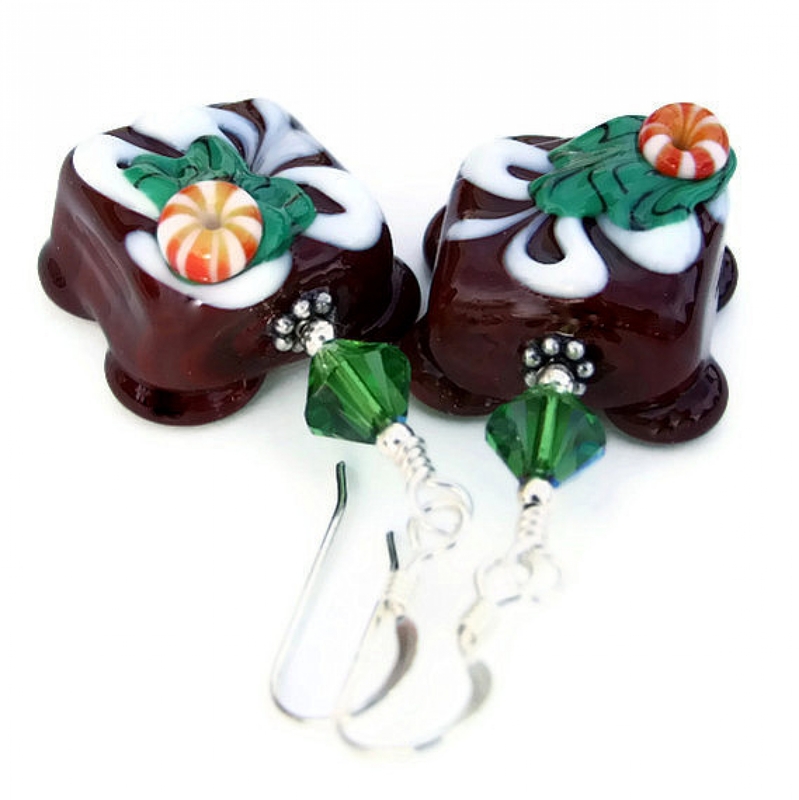 The lampwork petit fours were individually handmade by Nikki of BastilleBleu. 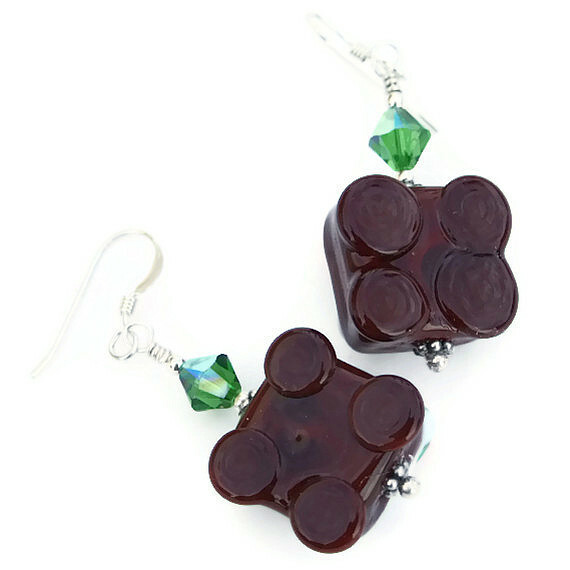 Starting out with a rod of glass and a torch, she melted a chocolate brown glass rod into the shape of a petit four. Then she carefully applied white glass icing. Last but not least, the leaves and peppermint murrini were added were made. The beads were then kiln annealed for strength and durability. The petit fours are decorated on one side only - please see the photo at the bottom of the page for a look at the back side. Because of this, I used an industrial strength glue to keep the earrings from turning; the detailed side of the beads are permanently turned to the front! Since each piece of candy is handmade, each has a slight difference in the design as you can see in the photographs. For extra fun, I made the earrings so that one peppermint sits in a top corner and the other is located in a bottom corner. 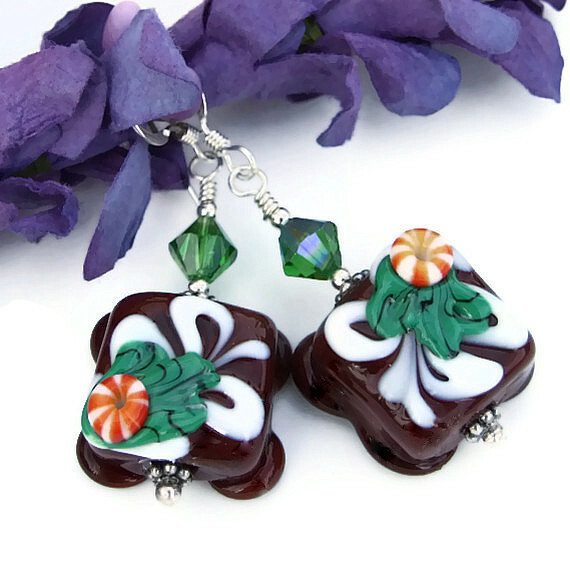 To frame the petit fours, sterling silver daisy spacers and 2 mm sterling silver beads were used at the top and bottom of the lampwork beads. To add a bit of sparkle (you HAVE to have sparkle during the holidays, right?) 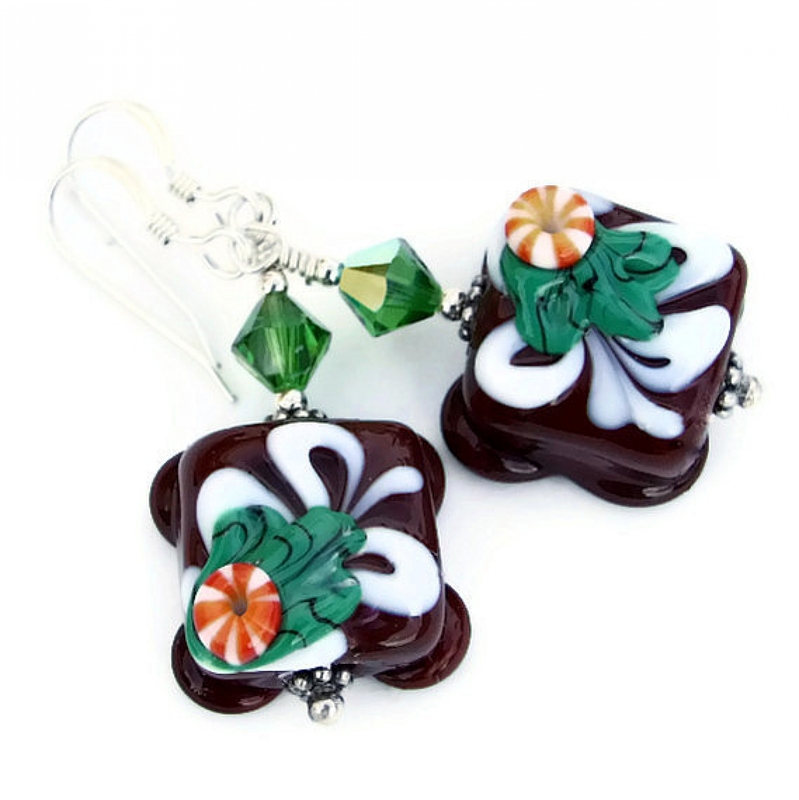 to the CHOCOLAT DE NOEL artisan earrings, 6 mm "fern" Swarovski crystal bicones were added to the top of the lampwork beads. The "fern" Swarovski crystals had an aurora borealis finish added for added glittery goodness. A perfect color to highlight the greenery and complement the peppermints. 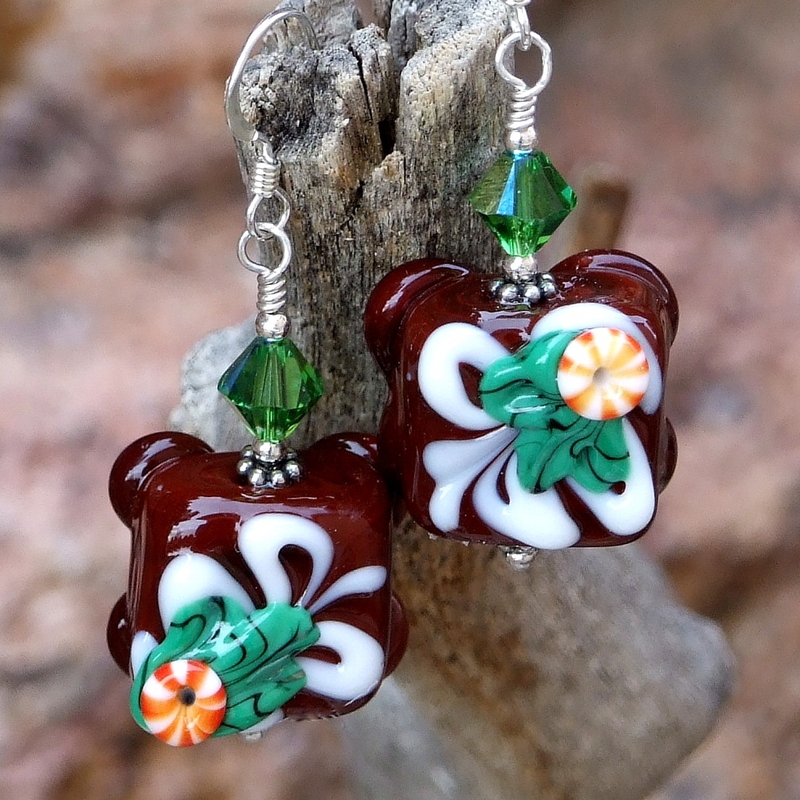 A sterling silver daisy spacer and sterling 2 mm beads separate the crystals from the lampwork beads. The components of the earrings were strung on sterling silver headpins. The headpins were then carefully wire wrapped to sterling silver French hooks. 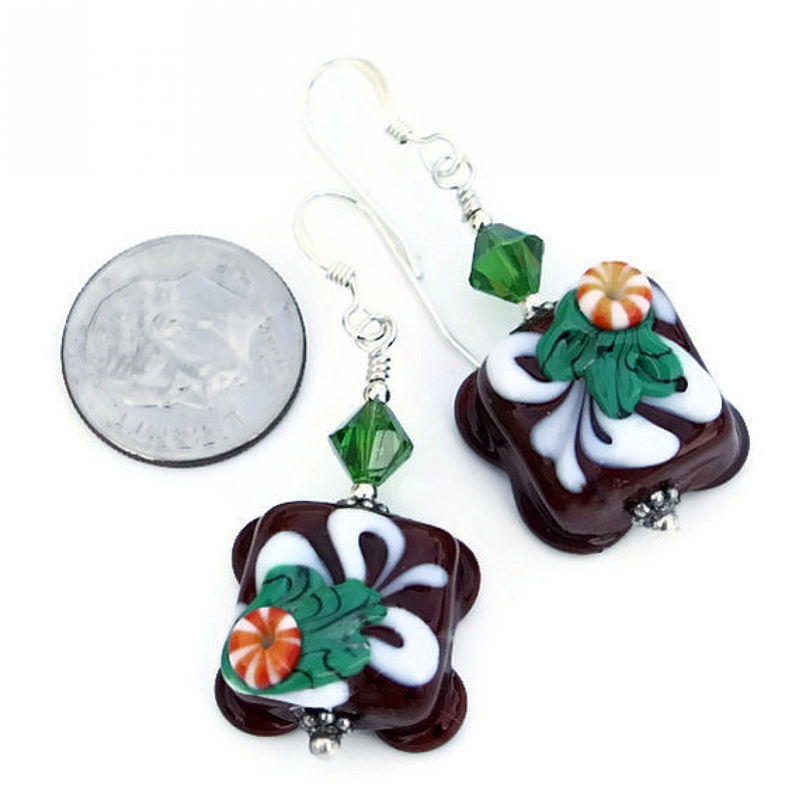 For a better understanding of the relative size of the lampwork chocolate petit fours used in the CHOCOLAT DE NOEL earrings, please be sure to check out photo #5 for a size comparison with a dime. Even though it is man made, glass carries the energies of transformation, rebirth and communication. Silver is said to be a metal of love and healing; it is a mirror to the soul, helping us to see ourselves as others see us. The CHOCOLAT DE NOEL handmade earrings will be carefully packed in an organza jewelry bag, perfect for gift giving to a loved one . . . or to yourself!